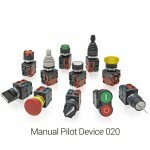 The SM2 “MODULAR SYSTEM 22” series gathers the 020 Ø 22 and 020 range of flush mounting operators. It is designed for a safe, easy, intuitive use; the solutions adopted facilitate the production o.. 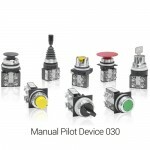 The new range of flush panel pushbutton switches is ideal for manufacturing command and control panels where the layout integrates both functionality and ergonomic needs, optimising man-machine di.. 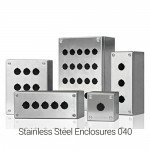 The Ø 30 push button panel is used in particularly demanding sectors because of its sturdiness, reliability and long operating life.Where precision, certainty of execution and versatility in technic..
A careful analysis of applications in special situations induced New Elfin to develop this line of containers in stainless steel with a particularly attractive and high tech design; these products..